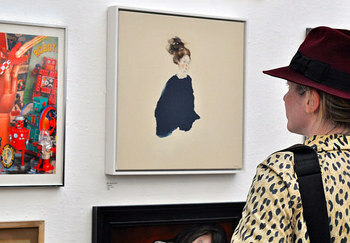 Last week I spend a delicious morning meandering through the breathtakingly diverse array of art of show at the RWA’s 162nd Open Exhibition. I spotted a characteristically contemplative painting by Serena Curmi (titled Judgment – but who is the girl in the image judging? Herself? ), and a beautiful, resonant sculpture (literally – when you run your hand over its spines, which you’re invited to do, it sings) by Kim Francis called Child. I brought along a largish notepad and a handful of pens, and took my time, pausing to jot down notes whenever an idea or thought nudged me. By the time I left I had ideas for half a dozen stories, a rough first draft of a poem and a complete piece of flash fiction. I urge you to do the same. 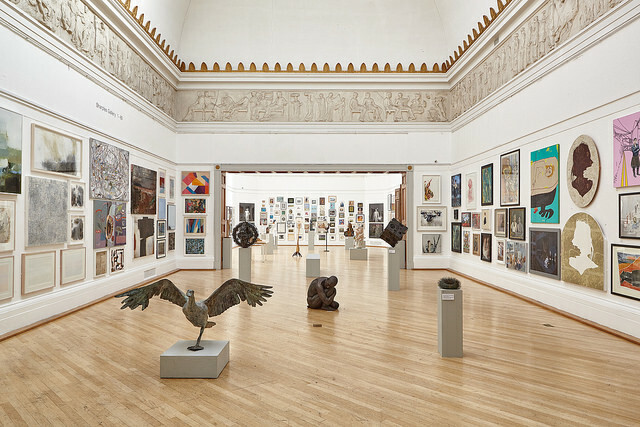 The RWA Annual Open Exhibition is on until 7 December 2014, but if you can’t make it to Bristol, why not visit your local gallery or museum? The key is time – a good, solid chunk of it, to soak in the works on display and allow your subconscious to take what you see and turn it into an original piece of writing. This entry was posted in Writing prompts and tagged inspiration for writers, RWA, story ideas, writing inspiration by Judy. Bookmark the permalink.